Pass the NCLEX the first time with these top ten strategy tips. No one wants to fail the NCLEX and take it multiple times. 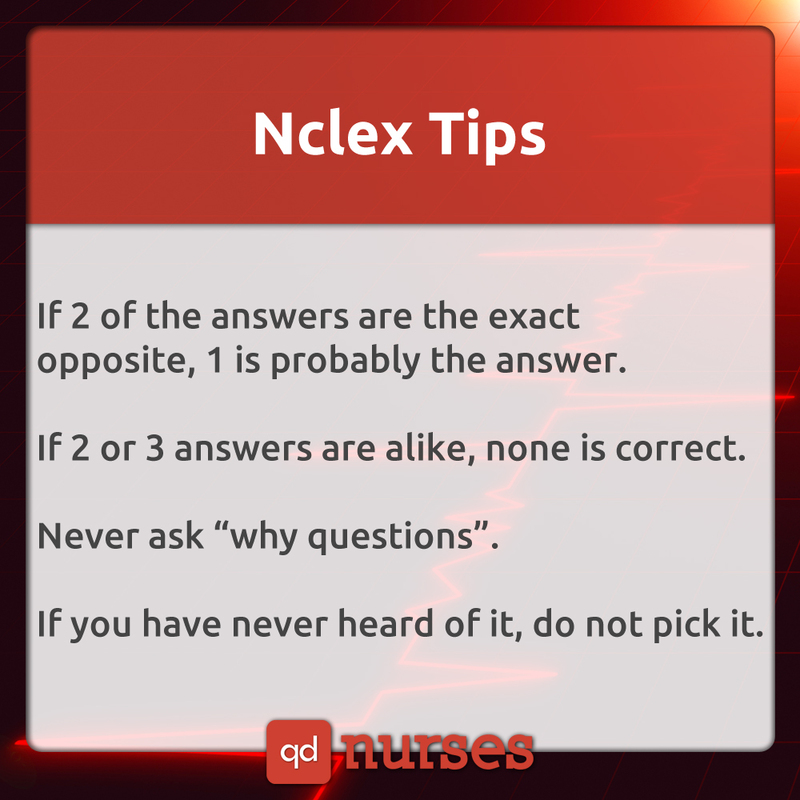 Take these tips and apply them as you practice your NCLEX questions. The NCLEX is one of the hardest exams that you will have to take and thank goodness you do not have to take it again! If you have failed the NCLEX, do not worry! You can do it. It is a lot easier to just say to believe in yourself than to actually just believe you can pass. I have helped students who failed the NCLEX several times and then they passed with just 75 questions. Just remember that these are not designed as a substitute for reviewing the content. These tips are designed to help you answer questions that seem impossible. Now you can tackle the impossible! What is the question asking you? Should you assess, evaluate, or come up with an action? Do you see any keywords? Do you see relevant information in the question? The patient is admitted with severe chest pain. What should the nurse do to obtain further information in planning care? You may say, “But I should take everything. All of the choices are correct!” Apply what you just learned. You know the question is asking you what should the nurse do with this patient. The nurse should assess. If you look at the question, keyword is further information. You need to assess before coming up with a plan of care. If B, C, and D are all vital signs, then A would be the correct answer. A acts as an umbrella to B, C, and D.
You may want to jump to conclusions and pick giving insulin because if the patient is diabetic, then you would want to prioritize insulin administration. The question did not provide you with information regarding signs and symptoms of hypoglycemia or hyperglycemia nor did it state anywhere that it was time to give insulin. Of course, you would want to restrict the patient’s fluids if the patient has kidney failure. But this choice has nothing to do with the patient’s depression. You would be left with C or D. Would you want to hear from a friend that you’ll have better days? Probably not. Choose the therapeutic choice. Be therapeutic. Be awesome. Is the question asking for something to be accomplished short-term or long-term? You may encounter a question with three choices that are long-term goals and one choice that is short-term. If the question expects the nurse to do something right away, you would pick the short-term goal. Patient states that he wants to kill himself. He has already been admitted for depression for two weeks now and is currently taking anti-depressants. What should the nurse prioritize? All of the choices sound wonderful. We want the patient to get out of the hospital, sign a contract, build relationships, and join a support group. The question is prioritization. A, C, and D are long term goals that will not happen right at this very moment. We can easily eliminate that. B is a short term goal. By signing a suicide prevention contract, the patient can understand that he/she should call for help when he/she feels the urge to take action. It increases your odds by 50%! The patient slammed her hand with the car door and has hematoma. What should the nurse do? Apply heat to the hand. Apply ice to the hand. Perform range of motion with the wrist. Keep the hand above the patient’s head. Let’s say in this situation, you do not remember what hematoma means. Does it mean the hand is broken or that the hand is bruised? (Hematoma is basically a bruise.) In this case, you see two choices where A and B is opposite. Should you apply ice or heat to the hand? Well, take a look at the scenario. She slammed her hand so if you apply heat to the hand, then the blood vessels will dilate and elicit further blood vessels. Applying ice to the hand would constrict the blood vessels. The answer is B. Do not delegate what you eat! Do not delegate what you can not eat. The nurse can not do everything alone, but if the nurse tries to delegate tasks that is out of the LPN or CNA’s scope, then that is considered a legal issue. A LPN cannot teach a patient new information, but can reinforce. LPN cannot assess a new symptom. LPN can administer oral medication. CNA can assist the patient to the bathroom. CNA cannot assist the patient to walk to the bathroom for the first time since surgery. This is a big one that gets stressed to nursing students every single semester. Hand washing is always the great obvious answer. But infection control is much bigger than that. A patient who has chickenpox should not be in the same room as a patient who is receiving cancer treatment. Don’t forget the disorders you need droplet precautions for. Do not touch Mrs. Wee! The odds of getting a question correct is 25%. The odds become greater when you can eliminate one answer that sticks out like a sore thumb. It’s even better when you can increase your odds to 50% when you see two answers that stick out like a sore thumb. I didn’t even give you the question and you already know that A and B are both non-therapeutic. You can eliminate the obvious. C is a great therapeutic response and D is a decent answer as well. How do you pick between the two? Choose the answer that can get you to elicit more from the patient instead of the answer that will end the conversation without getting more from the patient. What do you mean grammatical errors? This is the NCLEX. Of course there is none. But the answer must be consistent with part of the question. If the question is looking for a singular item, then you can eliminate the answers that is plural. If two parts of the sentence is correct but the rest of the sentence is incorrect, then you can eliminate the entire choice and move on to increase your odds. Look for the same similar words from the question to the answers. The option that has this specific word is most likely to be the correct answer. Of course you want to choose all of the above, but the patient has diabetes. Which answer correlates with diabetes? Blood glucose. The answer is A.